The earliest recorded military order was the Knights of Saint Peter, a militia formed in 1053 by Pope Leo IX to repel the Norman invasion. They lost the Battle of Civitate which led to a Norman alliance with the papacy and formal recognition in 1059 by Pope Nicholas II of the Norman conquest of southern Italy. In 555 A.D., the Byzantine Empire covered its greatest area since the fall of the western Roman Empire. Major territorial losses to early Muslim conquests in the 7th century caused violent clashes between Christianity and Islam, with Judaism getting caught in the bloody middle. The religious fervor of the Christians who journeyed to fight for God led to the Crusades, a lengthy series of wars sanctioned by the Roman Catholic Church. The Crusades stretched from 1095 through 1147. 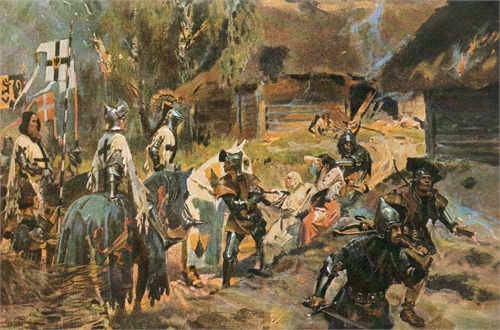 Most medieval chivalric orders arose during the 11th and 12th centuries in response to the Church’s call to arms. Some military orders also professed charitable purposes, such as caring for the sick and poor. Most well known of these was the Knights of Saint Thomas, also known as the Knights Hospitaller. Due mainly to bankruptcy and infighting among leadership, the Knights Hospitaller as an order vanished by 1360. Featuring more frequently in fiction--see The Da Vinci Code by Dan Brown, The Last Templar by Raymond Khoury, and Ivanhoe by Sir Walter Scott--and reproduced in historical reenactments than any other order, the Knights Templar also arose during the Crusade. Also known by other names such as the Poor Fellow-Soldiers of Christ and the Temple of Solomon as well as the Order of Solomon’s Temple, this military order was founded in 1119 by papal bull Omne datum optimum. Powerful and wealthy, the order’s members wore distinctive white mantles emblazoned with a red cross. With an enormous economic infrastructure, the Knights Templar is credited as having formed the world’s first multinational corporation. It dissolved in 1312 following the fall of Holy Land to the Ottoman Turks and papal surrender to the demands of King Philip IV of France to dissolve the order and thus forgive his heavy debt to them. Enduring fascination with this order can be found in Tactics and Manual for Knights Templars: Sword and Bugle Signals, Rules for Camps by H. B. Grant. Military orders continued to flourish through the Middle Ages, and their activities took them throughout Europe. As nuns, women also served in these orders and established convents attached to them. Most military orders ceased to exist by the 1700s, with those that continued mainly taking honorific and ceremonial purposes. Some, like the Teutonic Knights, continued their militaristic traditions serving those who paid them the most money. Although medieval in concept, orders continue to thrive. In 1888 Queen Victoria established the Order of Saint John of Jerusalem. Napoleon Bonaparte crushed the Knights of Malta in the late 1700s, but they regrouped in the 19th century. A decree of the National Assembly signed by the king of France abolished the Order of Saint Lazarus in 1791, but it revived in the early 20th century. The Roman Catholic Church also maintains some of its military orders, including the Equestrian Order of the Holy Sepulcher of Jerusalem, the Order of Pius IX, and the Equestrian Order of Saint Gregory the Great. For more information on military and chivalric orders, see The Military Religious Orders of the Middle Ages by Frederick Charles Woodhouse. The International Commission on Orders of Chivalry maintains a list of legitimate active orders.